At the invitation of State Councilor and Foreign Minister Wang Yi, Minister of Foreign Affairs of the Democratic People's Republic of Korea Ri Yong-ho will visit China from December 6 to 8. Q: President Xi Jinping just concluded his state visit to Panama during which the two sides signed a raft of cooperation documents. Could you offer more information on the outcomes of this visit? How do you comment on the current China-Panama relations? A: President Xi Jinping paid a state visit to Panama from December 2 to 3, during which President Xi Jinping held talks with Panamanian President Juan Carlos Varela and met with President Yanibel Abrego of the Panamanian National Assembly. The two sides had an in-depth exchange of views on bilateral relations and reached a wide range of consensus. The visit has achieved positive and fruitful outcomes. 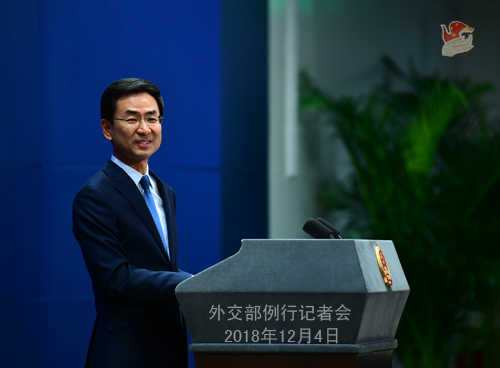 The two sides spoke highly of the strong momentum enjoyed by the development of bilateral cooperation in various fields since the establishment of diplomatic ties, and reaffirmed that the one-China principle is a consensus shared by the international community and establishing diplomatic relations is a right choice which has brought tangible benefits to the two peoples. The two heads of state agreed that development should be people-centered, which will guide bilateral cooperation to realize common development and enhance people's well-being. The two sides agreed to further synergize the National Logistics Strategy of Panama 2030 and the China-proposed Belt and Road Initiative, boost cooperation in such areas as finance, tourism, logistics and infrastructure construction, and effectively implement such key projects as railway, education and health care. China will make sure that the Panama Canal will be of greater effectiveness in China's deeper engagement in global trade. Panama is willing to fully leverage its advantages in geographic location and logistics, and become the gateway and bond between China and the Central and Latin America. The two sides agreed to champion free trade, support the multilateral trading system, and commit themselves to reaching a comprehensive and mutually beneficial free trade agreement so as to lift bilateral trade cooperation to higher levels and usher in a new chapter for economic and trade relations between Latin America and Asia. China welcomes more Panamanian imports such as marine food products, meat and pineapples, and Panama welcomes the investment of Chinese enterprises and their setting-up of branches in Panama. The two sides agreed to abide by the purposes and principles of the UN Charter, the norms of international law and the principle of non-interference in domestic affairs. China respects Panama's sovereignty over the Panama Canal and Panama supports China's peaceful unification cause. The two sides also called for the building of a new type of international relations featuring mutual respect, equality, fairness and win-win cooperation as well as a community with a shared future for mankind. Since the two countries established diplomatic ties in June 2017, bilateral relations have been growing with a strong momentum, with all-around cooperation yielding fruitful outcomes. China and Panama will work together and take the opportunity of President Xi's visit to elevate bilateral mutually beneficial cooperation to a new level, thus delivering benefits to the two countries and peoples and contributing to peace and development of the region and the whole world. Q: According to reports, senior US officials including Treasury Secretary Steven Mnuchin and White house Economic Adviser Larry Kudlow yesterday disclosed more details about the specific pledges they say China has offered on China-US trade issues. Can you confirm the remarks made by the US side? Can you give us relevant details? A: Yesterday, I took many similar questions. As to the specifics, I may still refer you to the competent authority. What I can tell you is that during the China-US summit on December 1, the two sides reached consensus and agreed to stop levying additional tariffs. The working teams from the two countries will follow the consensus reached by the two heads of state to step up consultations in the direction of lifting all additional tariffs, strive to reach a mutually beneficial agreement and endeavor to bring the China-US economic and trade relations back to the normal track as soon as possible. Q: What are you expectations for DPRK Foreign Minister Ri Yong-ho's upcoming visit to China? Will the two sides discuss the denuclearization of the Korean Peninsula? A: During Foreign Minister Ri Yong-ho's visit to China, the Chinese leadership will meet with him. State Councilor and Foreign Minister Wang Yi will have an in-depth exchange of views with him on China-DPRK relations, the situation on the Korean Peninsula and other issues of mutual interest. We believe that Foreign Minister Ri Yong-ho's visit will play a positive role in further implementing the consensus reached by the two top leaders, promoting the growth of China-DPRK ties and enhancing the communication and cooperation on the Korean Peninsula issue and other issues. Q: The National Public Radio of the US in a recent report referenced a working paper by the Aid Data team at the College of William & Mary. This paper analyzed satellite images of the global distribution of night lights and found that China's infrastructure projects have brought more lights to the places where they're built, thus "lighting up" the development prospect of the region. It also said that China's infrastructure projects in developing countries, especially in Africa, have greatly boosted local economic growth. What is your comment? A: You know that we usually do not directly comment in specifics on the viewpoints and reports by media, think tanks, experts and scholars. To say something in principle, of course we welcome these objective and unbiased reports and comments made by media and research institutions on cooperation between China and Africa as well as between China and developing countries. I want to point out that more and more data and evidence have shown that such mutually beneficial cooperation between China and the developing countries including those in Africa has provided a strong boost and made significant contributions to local economic and social development. The China-Africa cooperation outcomes have won the unanimous approval of African governments and acclaim from African people. China and African countries will work together to advance the implementation of the eight major initiatives announced by President Xi Jinping at the FOCAC Beijing Summit. China also stands ready to make more efforts with other cooperation partners worldwide to advance Africa's cause for peace and development. Q: According to a press release by the Pakistani Foreign Ministry on November 3, US President Donald Trump addressed a letter to Prime Minister Imran Khan, in which he stated that he has sought Pakistan's support and facilitation in negotiating a settlement to the Afghan issue and would like to improve the US-Pakistan relations. He stressed that Pakistan and the US should explore opportunities to work together and renew partnership. What is your comment? A: We have noted the relevant development and welcome this positive interaction between Pakistan and the US. The sound development of Pakistan-US relations will contribute to the international counter-terrorism endeavor, an early realization of reconciliation and reconstruction in Afghanistan, and regional peace and stability. 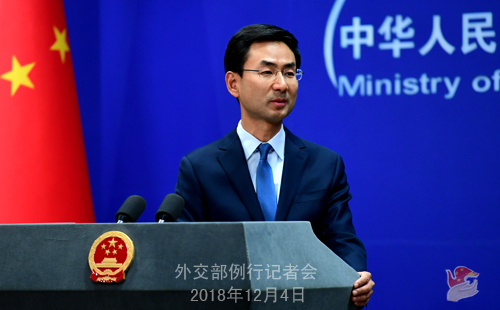 China welcomes the improving Pakistan-US ties and supports the two countries in conducting equal-footed and mutually beneficial cooperation, enhancing communication and cooperation on the Afghan issue, and making joint efforts to promote peace and development in Afghanistan and the region. Q: With regard to China-US trade issues, today, the US side confirmed that US Trade Representative Robert Lighthizer will be the representative of the US working team. What is your comment? A: The US side designating the representative of their working team is their own business. Journalist: Mr. Lighthizer takes a hard-line position on China. 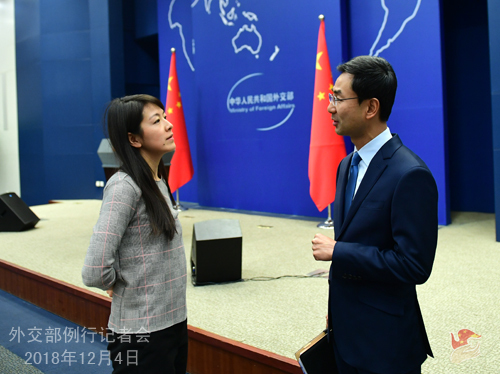 Geng Shuang: The working teams from China and the US will follow the consensus reached by the two heads of state to step up consultations and strive to reach a mutually beneficial agreement at an early date. Q: Yesterday, US President Trump tweeted that he will start talking about "a meaningful halt to what has become a major and uncontrollable arms race" with the Chinese and Russian leaders. What is your comment? A: Peace and development are the themes of the times. China is committed to the path of peaceful development and pursues a national defense policy which is defensive in nature. China has never taken part in arms race of any kind or posed threat to any country. Q: During DPRK Foreign Minister Ri Yong-ho's visit to China, will the two sides discuss President Xi Jinping's visit to the DPRK? A: I have no information to offer to you at this point.